Laurier's library has three locations: Waterloo, Brantford (Grand River Hall) and Kitchener (Lyle S. Hallman Faculty of Social Work). In total, the library provides access to over 400,000 electronic resources (books, databases and journals) and holds one million print resources. Plus, you can find course readings on reserve by logging into Ares. But the library is so much more than a place to read. It’s an academic hub and space for community-building and creative expression. The library’s services range from in-person workshops to 3D printing. 1. Laptops, Study Space and Printers – Oh My! Forgot your laptop? Don’t sweat it. The library has computers available for you to use. If you need to study, set up in one of the individual carrels or work with friends in a group study room or presentation practice room. You can print, scan or copy anything you need at the library. You can even submit your print jobs online at printme.wlu.ca and pick them up at any campus printer by swiping your OneCard, which releases the print. Don’t know where to start on a research project? Start at the library. The library offers online and in-person research assistance. Chat live or meet one-on-one with a librarian who can help find what you’re looking for. Refer to subject guides, helpful resources outlining top research materials for your area of study. If your professor set up a course guide with the library, it’s easy to find the information sources you need. And keep close tabs on the library’s events and workshops. Free workshops are offered throughout the semester. Citations can be tricky and cumbersome, but they’re part of academic writing and the library can help you learn how to cite properly. It can also be confusing to organize and use citations in your work. The library offers free tools to help you automate citations. If you’ve searched Laurier’s main collection and can’t track down the right resource, don’t give up. Chances are another university will have it. You can request resources from the University of Guelph, the University of Waterloo, The Annex (an off-campus storage facility) or other Laurier campuses through Primo, free of charge. Books or hard copies are delivered in one to three business days. Electronic resources are delivered by email, in PDF format, as copyright and licensing allow. Watch the Primo video for detailed instructions. 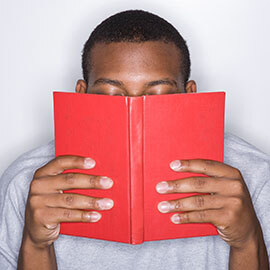 If your initial Primo search comes up empty, try your luck with Laurier’s interlibrary loan service, connecting university libraries across Ontario. Get your hands on a resource, whether it’s at the York University or Western University, by requesting it through RACER, mostly free of charge. Watch the RACER video to learn how. We have librarians assigned to every program subject and campus at Laurier. These helpful folks are an invaluable resource. You can also book a librarian for one-on-one assistance with your research. Let your creative side show. All Laurier students are welcome to visit the Library Makerspace located in the Waterloo campus library on Maker Mondays from 1 to 4:30 p.m. Discover what you can create! The library is home to beanbag chairs, loungers and a new MetroNaps EnergyPod (a sleeping pod). Check it out today. And you can also de-stress at the library by chilling with dogs. Yes, that’s right – dogs! Watch for upcoming dates. The Robert Langen Art Gallery (RLAG) serves as the visual arts centre for the Waterloo campus and community. RLAG presents four professional artists each academic year. Exhibitions are open and free of charge to the campus community. The gallery and library play host to various arts and culture activities and events during the academic year, including Music in the Library, the Edna Staebler Book Awards, Artist Lectures and a Holiday Market. The library is one of the largest student employers on campus, offering both paid and volunteer positions – gain valuable work experience and income. You can also find ways to volunteer with the library to help make our spaces an outstanding experience, including the Library Students Advisory Council. That’s a lot of information to take in and you probably have more questions. Your next step is to chat with our friendly User Services staff, online or in person just inside the front door!